Better Than the Beach. Ocean and Valley view. Very private. Beauty everywhere. Very private, exotic house with spectacular view over valley to the sea. Very romantic. Unbelievable sunsets. The house is a labor of love, but the spot alone makes living here delicious. Perched on the edge of a 50-acre tree farm, the deck is a great place to watch falcons, kites, toucans and chattering flocks of parrots. Hummingbirds visit nearby flowers (arbors and pergolas make plants part of the architecture), and butterflies occasionally fly through the house. Because of the elevation, biting insects are almost nil. Days are hot but there's always a breeze; nights are fresher and good for sleeping. Unlike lower elevations, the area stays lush and green all year. Bougainvillea, palms and other tropicals share the stage w/ azaleas, tree ferns, and jasmine, which rambles up the outdoor showers. The gardens have been planted with perfume in mind. Mornings ring with birdsong and are a good time for a hike. Afternoon heat is beat by a 5 min ramble to the waterfalls- great for rainforest exploring and skinny dipping. A little dam creates a 30x40 ' jungle pool. The water is clean and cool, the site wild and beautiful. Or you can go to the beach. ..
Well-situated between Dominical, one of CR's premium surf havens, and San Isidro, a bustling little inland city. We're 30 min from each.On the way to Dominical, reserve for a 1-day horseback trip to Nuayuca Falls, a spectacular cataract and swimming hole. You stop halfway there for breakfast and halfway back for lunch at the family ranch w/ resident toucans and scarlet macaws. Dominical is a bit of a scene; you'll find several restaurants and nice surfer atmosphere. There are nature reserves w/ wildlife tours, zip-lines through the canopy, deep-sea fishing packages (some of the best in the world), and tennis at Rio Mar. 15 min south is Ballena National Pk, a gorgeous string of beaches. San Isidro is the place to shop for food and anything else you might need. We try to time our errands for Thursdays & the huge open-air market where you find everything from organic arugula to sugarcane. Right of the main house, separated by a flower-decked wall, is the master cabina. A smaller version of the main house w/ hardwood ceiling and accordion doors framing a similarly gorgeous view, it holds a queen bed w/ lge custom mosquito net, bamboo armoire, and closet. An outdoor shower and sink framed by jasmine and orchids + a small private garden and seating area provide charm and intimacy. A second cabina is perched above-right from the first, screened by a garden. It has its own deck and outdoor shower with great view, hardwood ceiling, screened windows. Inside is a queen bed, closet, and small bath with toilet + Mexican sink. The 3rd cabina is left of the main house, down the deck through a pergola. It has an italian tiled floor and hardwood ceiling set upon four white columns. Locally-made bamboo blinds shield morning breezes. A fragrant hedge provides intimacy and frames a private garden with a table + 4 chairs in teak. Dble bed with generous net, armoire and chairs are all locally-made of bamboo, and a hammoc is slung between 2 columns. It too has a sink/vanity + shower and is very romantic! huge, dramatic view over rainforest, then valleys to the sea--beautiful! Some condiments and herbs and spices are available. We always provide coffee, milk, bread, butter and eggs for our guests for at least the first morning. Gas stove, electric toaster, food processor, blender, micro wave, convection oven, etc.Very well-stocked--we love to cook! Beautiful view over the valley, separated from kitchen by a hard wood 'peninsula' so socializing while making and eating dinner is great. 4 teak chaises-longues and little tables; teak table + 3 chairs in rancho cabina. Spacious flagstone deck with columned pergola. Pool adjacent to main deck Exotic Jungle Pool made by damming one of the small rivers that define the property. Several dippable waterfalls nearby. A birder's paradise, this is a very secure property with caretakers' house at the entrance to the farm; our house is well inside the farm and very private and exotic. Caretakers are warm, honest, highly responsible people and a real blessing! No visible neighbors. The climate is delicious, and there are several fruit trees on the property. We have a milk goat so fresh milk is a possibility. Maria will do some housework and /or babysittiing for $3 /hr. We have found a wonderful caterer, a top of the line retired professional from the Sates, and she can provide dinners for $20 / person. A friend's Costa Rican mother can provide yummy local food for about $8.00/ person.Perfect for honeymooners or up to 3 couples with kids. Mainhouse has seen many wonderful parties and individual cabinas afford great privacy. Lots of eco-adventures to be had in the region! We visited February 3rd through 10th and had an absolutely amazing time! Francois was a fabulous host. Very attentive to our needs but also gave us the space to enjoy the property on our own. Everything you could need was available for use. Lounge chairs, towels, any kitchen items you may need and much more. The main house was a great gathering area for our group of five. We spent every morning listening to the howler monkeys and toucans nearby and having coffee on the lounge chairs just outside of the main house. Following that, our breakfast in the open air of the dining area. The individual cabinas were perfectly spaced out for when we wanted private time as well. The beds were comfortable and with the nets provided over the beds we never had any issues with bugs. We left our doors open to the main cabina every night and the open air sleeping quarters was a fun treat as well. I was worried about the outdoor showers at first but as soon as we left I was telling my husband how much I will miss it. Views of the mountains, fresh air and nature sounds while showering.. Can't beat it! If we come back to Costa Rica in our future travels we would not stay anywhere but here! Thank you Francois for hosting us at your beautiful property. We appreciate everything you did for us!! Pura Vida! We loved the short hike to the beautiful waterfalls on property and the pool was a refreshing spot to take a dip in after the hike back up. We had many meals at local restaurants. Mirador Los Chorros has great food and an even better view of the sunset. An absolute must is to visit the Bohemian town of Dominical. We had an amazing breakfast and dinner at Tortilla Flats along the beach. There were many vendors set up with little trinkets which was very convenient. The best restaurant we visited there was Por Que No. The food was delicious and had a beautiful view. One night we also had a local women cook us dinner during our visit and it is a MUST if you stay here. Francois sets everything up for you, all you have to do is show up hungry! If you are considering staying here do not contemplate any more. Book this place and you will not regret it! The views from this property were fantastic. We had 5 people in our group (2 couples and 1 single person). It was nice that we had our own private areas and a main house to socialize in. The kitchen was great because we were able to shop in town and make dinner there, which saved some money. The owner was very friendly and gave us plenty of advice on local places to eat, shop at and visit. The beach is about 30 minutes away and it was nice to hike the property and cool off in the pool after. The locals were also very friendly and patient since none of us spoke Spanish. We ended up paying for most of our items with debit/credit cards, but almost everywhere took american money as well. I would recommend exchanging around $100 in Colones just to make it easier for you and them. Overall, we LOVED the experience and would definitely rent this property again. Within hours of our arrival, the stresses of a year's worth of our normal life faded away. Beautifully maintained, with a passion for preserving the environment, the owners are wonderful hosts who would bend over backwards to ensure that your stay is comfortable. Although nature's alarm clock came bit early, to experience the choruses of howler monkeys and toucans at 6AM was other-worldly. Highly recommended. Costa Rican Paradise! My family and I had an amazing time. 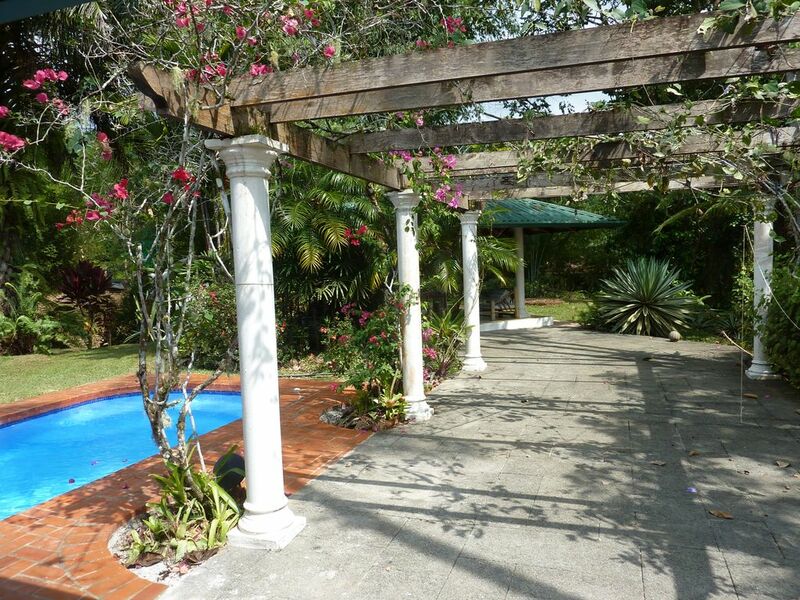 The house is beautiful, the property magical and the hosts were gracious and accommodating. Perfect place to relax or have an adventurous day with the kids exploring the jungle around. We would certainly stay here again! Stayed here with our six children comfortably. The hosts were great, the weather fantastic. My family and I were enthralled with the scenery from this home. Words cannot describe our initial feelings upon arrival at this utopian setting. Waking at dawn to the sounds of birds, including toucans, parrots and countless tanagers outside our rooms made us leap from beds. Frogs croaking in the evening, the romance of the cicadas in the afternoon, so many wondrous insects including grasshoppers that kept us on the lookout for more. Showering outdoors was exhilarating and the drive to the home offered incredible vistas. The open air layout was so romantic and the ability to just walk to different waterfalls almost made us want to just stay in every day. However, the sights to tour within 30-60 minutes, countless quiet almost deserted glorious beaches and horseback riding drew us out almost every day. However, we could not wait to get back to the house every afternoon to witness the spectacular sunsets and my younger twins would relish the fresh pool before dinner. Our hosts were friendly and so helpful in every way. We could not have asked for a better visit, if only it could have been longer. We will never forget this glorious and amazing home!